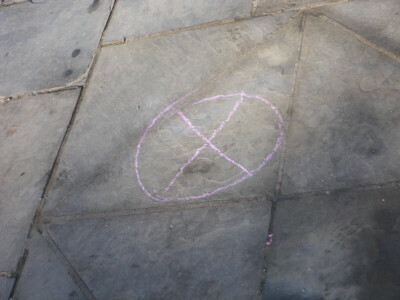 So today I walked in and in the middle of the Quad is a pink chalked circle with an X. Why? Dunno. There aren’t any other pink chalked things and the slate isn’t particularly broken or otherwise in need of replacing that I see but I guess it needed chalking. 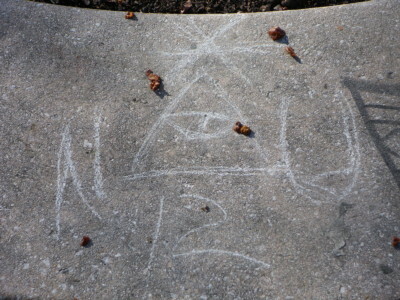 So I went looking for other oddities to post for today, thinking I might do a graffiti day. 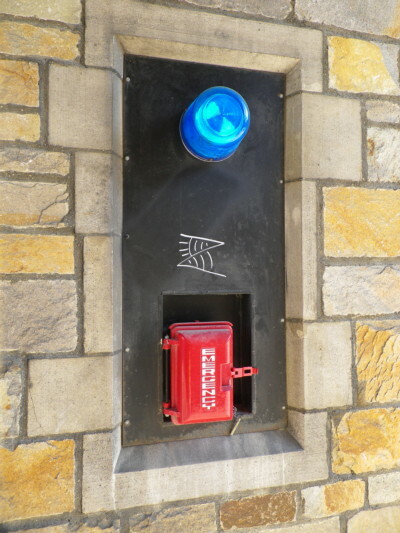 Especially when I spotted double looking eyes on the emergency phone. 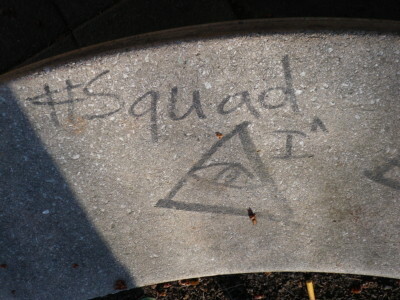 The pair of these were on a tree bench outside Jimmy Johns. They look kinda like frat Illuminati, if there is such a thing. TheMan and I took our lunch to the museum cafe place and on the way I got nothing more to show for my search for graffiti. Perhaps that’s a good thing. There were remnants of spray chalk adverts, this being the most clear. 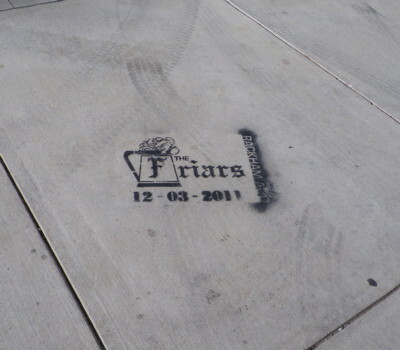 Sadly, I missed the Friars by several days it seems. 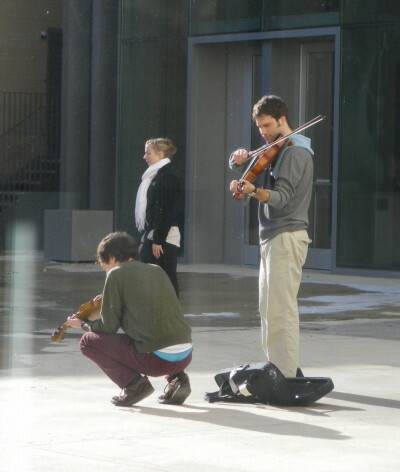 While eating, we saw a group of students wander by; two with violins (actually, a violin and viola but I couldn’t tell from the cases) and we thought nothing more until they started setting up in the courtyard by the museum addition. 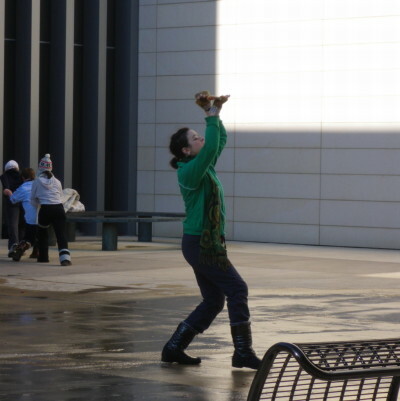 About 10 women stationed themselves about the court, some using the art or benches as props to their dancing. 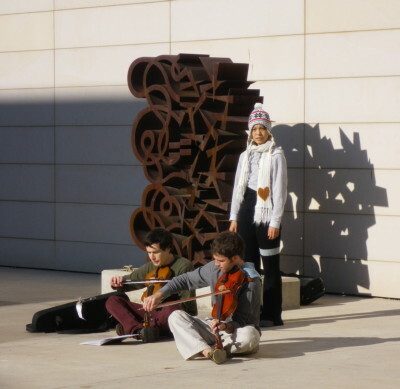 When we got outside, the musicians were also singing with a eastern chant style while the dancers danced. 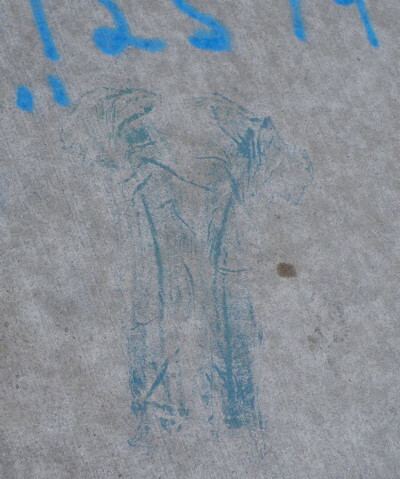 Less interesting, on the way back to work I found another splat shirt print. This one is not as clear as the first one I found. Perhaps there are more? 2007: Who doesn’t love some Japanese snackage? 2005: And then I discovered THAT’S THE POINT OF THE WHOLE TUNE!!! Going from door to door and getting free handouts (bonus!). 2004: No anything for you, impromptu or otherwise. 2003: I really don’t like tooling out in the cold when there is no promise of hot cocoa at the end of my trip either. 2002: Maybe I would add a little anecdote about the time we had a huge argument because one of us hung an ornament that was NOT tiny mouse Santa on the top hook of the tree and there by committed the Ultimate Sacrilege. 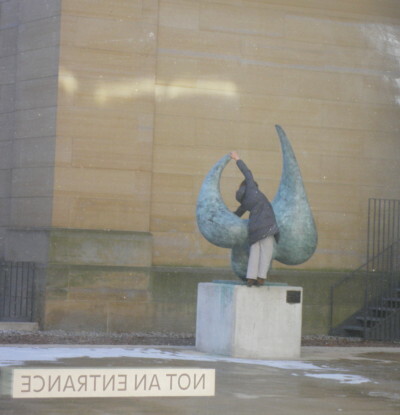 This entry was posted on Monday, December 12th, 2011 at 10:52 pm	and is filed under Picto-blogging. You can follow any responses to this entry through the RSS 2.0 feed. You can leave a response, or trackback from your own site.